Successfully Added Interpol - Biometric Fingerprint Door Lock (Right) to your Shopping Cart. If you're looking for Presidential type keyless door security for your estate home or corporate headquarters, then The Interpol biometric fingerprint door lock is for you! Research & Development: The Interpol biometric fingerprint door lock results from decades long research and millions spent in advanced entry solution development. Incorporating an 8 chip fingerprint processor array designed by Texas Instruments for advanced digital signals processing, its PCB (Printed Circuit Board) employs a sealed, dustproof, waterproof, anti-corrosion, and antistatic design for safe and stable operation. The Interpol also features a revolutionary PVD (Physical Vapour Deposition) coated fingerprint optical module which overcomes the most common problems associated with failed fingerprint readings. PVD is a technology usually associated with self cleaning surfaces to keep the FAR (False Accept Rate) under 0.0001%. The Interpol also employs a patented fingerprint identification algorithm which is able to instantly identify the correct fingerprints regardless of finger angle placement. Features & Benefits: Eloquence aside, The Interpol is built like a T-34 tank and can withstand just as much punishment. Translation - those who are meant to stay out aren't getting in no matter what! It employs a virtually impenetrable heavy gauge cast steel body and is characterized by an integrated stainless steel and chrome finish so it looks as good as it performs. Extensive research has also been put into developing the ideal mortise for The Interpol in accordance with the American ANSI standard. To that end, it utilizes a 5 latch Mortise G and deadbolt system for higher security and protection making it the perfect keyless entry solution for 45-50 mm doors. The Interpol requires no external wiring for easy installation and also comes with three unlocking modes: fingerprint, password, and mechanical key override in case of emergency! Builders & Remodelers: If you sell to the super-rich and famous, how will you justify the price tag on those multi-million dollar estate homes and resort villas with normal door locks? Take your entry protection and design strategy to the next level with The Interpol biometric fingerprint door lock! Nothing will get home buyers to sign that offer to purchase like seeing their soon to be 2.5 acre mansion fully fitted with the latest techno-wizardry. Personal home theater room, fitness room, basement swimming pool, and now bedrooms, dens, the interior garage and basement doors protected with The Interpol! Individualized and convenient - you can lose your keys or forget your password, but no two fingerprints are alike! Unavailable at Wal-mart or Home Depot stores that generally cater to a lower end security clientele, let The Interpol biometric fingerprint door lock be an essential part of your next big building project! Brought to you by the wholesale Security Equipment and Solution Specialists - Chinavasion.com! - Under factory default setting - any fingerprint can unlock the lock. Easily enroll/erase stored fingerprints on the lock directly. Unique passage mode which deactivates the lock for meetings and gatherings. Passwords must be 11 digits long and cannot start with a 0. PVD coated glass surface of optical fingerprint sensor, enhancing the damage resistance of the sensor. Mechanical key override for emergency. Deadlock function: when the door is closed, the deadlocking latch is pressed against the door frame which prevents the door from being opened credit card insertions or other common robbery strategies. 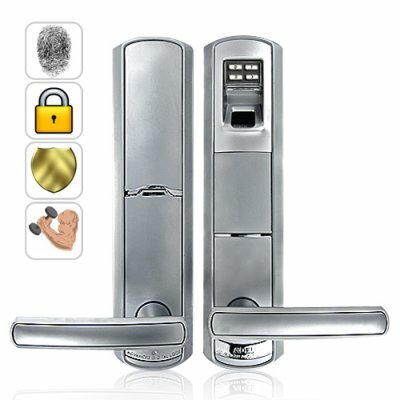 Similar biometric fingerprint door locks sell for double the price! How do you enroll the master fingerprints? In the new lock state, press "0" to enter the door open mode, then wait 3 seconds and press "1" to enter the enrollment mode. Next, enter "0001" since this is the first fingerprint memory location. Press finger against the fingerprint collection window. A beep will heard to indicate the first master fingerprint is set. How do you enroll member fingerprints? Press "0" to enter the door open mode, then wait 3 seconds and press "1" to enter the enrollment mode. Next, enter "0004" since this is the first memberfingerprint memory location. Press finger against the fingerprint collection window. A beep will heard to indicate the first member fingerprint is set. What are the chances of someone guessing my password? The Interpol requires a 11 digit password and the first digit cannot be zero. Therefore the chances of someone guessing your password is 1 in 90 billion! Why would I buy a door lock online instead of at my local locksmith shop? More and more, especially for high end homes we're seeing the rich and wealthy buy door locks online. Buying locally means that someone you know or someone who knows where you live might have an extra copy of your master key. And you definitely DON'T want that!